We started our food truck with two simple goals in mind: Make great testing authentic Mexican tacos, and to put smiles on peoples faces. Over the years, we have accomplished those two goals many, many times over. The Taco Man started as a simple taco truck, but since then, word of mouth has traveled fast and people are craving our food. We built this website to help people find us easier, see our menu, and have the opportunity to always enjoy great tasting Mexican food. Vegas is a really big city, and sometimes, with how bad traffic can be, driving 30 minutes for some food just doesn’t seem all that fun. That is where The Taco Man shines. We want to make sure everyone can enjoy our Mexican food at anytime during the day. Whether you live in Henderson or Summerlin, our authentic Mexican food will always be somewhere near you. No more deciding where to eat each night. The choice is clear! The Taco Man Food Truck has the right food for you. We post our weekly schedule every Sunday so you will be sure to know exactly where we will be everyday of the week. Our Mexican food truck will never be too far away. We aren’t just your typical food truck. We are much more than that. Whatever situation you can think of that needs food, you can trust The Taco Man will be there to help you. Throwing a going away party? No problemo! Having a sweet pool party? Count us in with the food! Having a church event to praise Jesus? hallelujah! We will supply the food. Did you just get married? I now pronounce you fed and satisfied from our food! Did you just get a divorce? How about we “split” the quesadilla together! Celebrating your sweet 16? Best way to do that is eating 16 tacos. The point is, whatever life throws at you, and you want amazing, authentic Mexican food, give us a call and we can make it happen. "...our family was impressed and enjoyed the service of Taco Man Las Vegas!" From the moment I called to reserve our date for my nephew’s graduation party I was impressed with the professionalism from Omar. The staff that came to our home was very professional and attentive to our needs. The food was tender and flavorful, and the quantity was plentiful. It was really nice that they also provided all the condiments and paper goods. All in all our family was impressed and enjoyed the service of Taco Man Las Vegas! 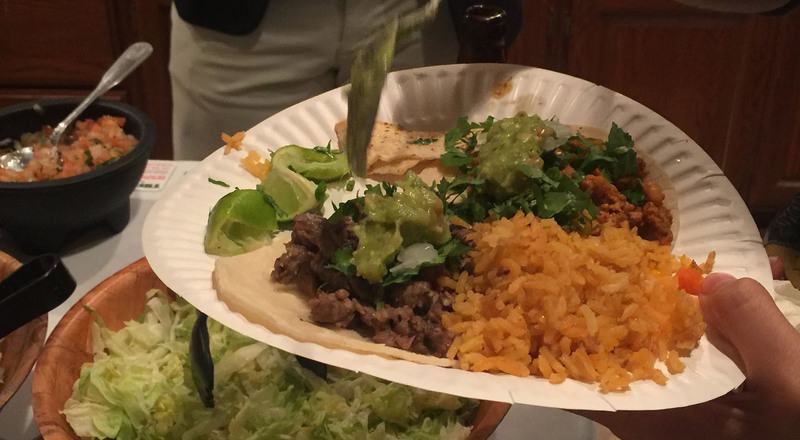 We’ve catered The Taco Man for different events at our church and we love them! They are always very professional and give the best customer service. The food is outstanding too! Definitely a great choice if you need to feed alot of people. What Food Would You Like at the Event?